¡Hola hola! And happy transfers! This has been a pretty big week, but we'll start of with a bit of news. Transfer boards just came out and I will be heading out to the "sticks"! I'm going to miss the legendary New Brighton Ward, but I will have fun down south in St. Peter! I'll be sure to keep you posted about it next week. Some other great news! The less active Hispanic family, la familia Arcentales finally came to church on Sunday! That was a huge step for them, and it's so wonderful to see their hearts beginning to soften and their desires to grow in the gospel increase! Super cool miracle to see them there. We had zone conference on Wednesday which is always a highlight of the week! Definitely a spiritual boost that I needed. There was a big focus on teaching repentance, and it was super powerful. We sang one of my favorite hymns, "I Stand All Amazed." I just want to share with you a few of the lyrics that always touch my heart. I stand all amazed at the love Jesus offers me, Confused at the grace that so fully he proffers me. I tremble to know that for me he was crucified, That for me, a sinner, he suffered, he bled and died. What powerful words to read, that we have a loving Heavenly Father willing to send his Son to suffer for us! He knows our pains and our afflictions and through Jesus Christ we can receive strength and forgiveness in our lives no matter how far we feel we have strayed! So, we visited with Elmer on Tuesday to get him all ready for his baptism, and we thought we would stop by one more time on Friday to check and see how he was doing. And he told us some pretty shocking news -- that he would be leaving the next week for his summer job in north Minnesota! We originally expected him to leave in May, but he got a call saying that he needed to go early. 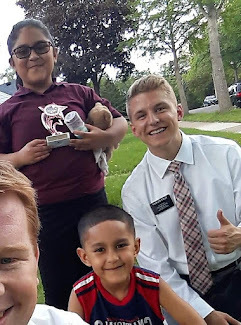 It was super sad to hear that, but he was still very excited for his baptism and the good news is he will return in August! We are arranging to stay in touch with him as much as possible and even coordinate skype lessons with him, which will be super fun. We are continuing to pray that everything will go smoothly! Despite Elmer's situation, he was ecstatic to finally make the covenant to follow Jesus Christ and be baptized by proper priesthood authority! We had an incredible baptismal service and were beyond blessed to have a double baptism with the sister missionaries in the ward too! So, we had Elmer and the sister's investigator, Steve Entonces. It was bien Spanglish! haha. It was amazing to see the change and happiness that has been brought into both of their lives! Hearing their testimonies was really touching, and they were both so thankful to have found so much happiness in this church and feel closer to their Savior. Just like them, I am unbelievably blessed to have the testimony I have of the truthfulness of the message we share with others, that Jesus Christ is our Savior and Redeemer and that this is his restored church here on the earth today!